Haiku, Dogku and Hi, Koo! | What is ML Reading? Haiku, Dogku and Hi, Koo! We turned the evening into a night of poetry. First, reading a few poems of ML’s choosing from the classic, A Light in the Attic by Shel Silverstein. I’m always amazed at the things ML’s learned without my knowing it. When I asked “Do you know what syllables are? She sighed, “Of course, Ms. Vinal taught us.” Ms Vinal is the music teacher. What a great place to learn about syllables. Finally, I asked, “Do you want to write a haiku?” She said, “No, you.” So I unleashed my inner poet. ML checked to make sure the first line was five syllables, the second seven syllables and the third five syllables. Two of my poems received checks. One received, “try again.” The two correctly formatted poems are below. Embarrassingly the one with too few syllables included ML’s name. I forgot it has three syllables, not two. 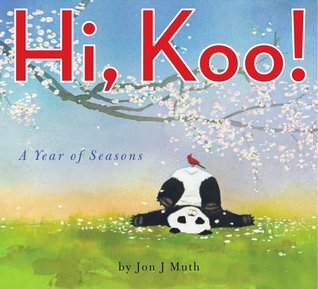 Yesterday, we received another picture book told through haiku: Hi, Koo! A Year of Seasons by Jon J. Muth. I told ML about it when she was picking out bedtime books. She was eager to read it. I looked in my bag and realized I left it at work. I need to go put it in my bag right now before I forget. While I’m doing that, sit down and try to write your own haiku. You’ll exercise a part of your brain many adults often forget to use. 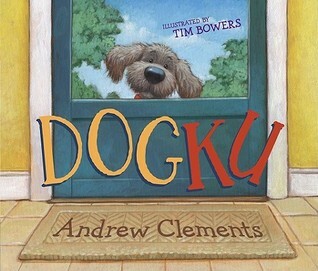 This entry was posted in Picture Book, Poetry and tagged Andrew Clements, Dogku, Hi Koo!, Jon J Muth, Tim Bowers by mlreads. Bookmark the permalink. LOVE your choice of books! Thank you! I’m printing this up for myself. Not every mom can say an accomplished children’s book author and illustrator has written a haiku for them.